How Much Do Solar Panels Save Me Over Time? Residential solar panels can seem like a hefty investment. And truth be told, without federal tax credits or state incentives, they can be. But if you’re asking how much money solar panels cost, you’re asking the wrong question. What you need to ask is: how much do solar panels save? Obviously, you’ll also save on the amount of energy you use because you won’t be paying the same price for high energy bills. Electricity is much cheaper in some states than it is in others, so solar is really going to benefit you if you live in a state that offers high prices and tax breaks. Read our extended post about the cost of solar panels here. Any one of these conditions will affect your cost to go solar. So, worst case scenario; if your state had low sunlight, offered no incentives to help you buy solar, and lets your electric utility charge you more if you use less of their electricity (which you will if you go solar, right?) then solar might be more expensive for you. Luckily, no state in the US has every one of these potential cost drivers. In general, some of the more sunless states – for example in the Northeast – have tended to counter their solar deficiencies by offering state incentives and decoupling their electric utilities so that the higher costs of lower insolation won’t hit you too hard in the pocket book. Conversely, abundant sunshine can still mean you need less of an outlay to buy a solar system that supplies your needs in states like Nevada and Arizona, even though they have poor net metering policies and low incentives, because 10 hours of sun a day makes it easy to generate from a smaller (cheaper) system. So each of these elements can be balanced out to counteract the worst effects. Northern states get fewer than the national average hours of sunlight a year. Alaska is the most extreme example. It gets an annual average of just four hours of sun daily. How can that add to cost? A solar system will need to be bigger if you live in the northern part of the nation where the hours of sunlight daily tend to be lower, so that it takes a bigger system to supply the same amount of electricity. The further north you go, the fewer hours of sun are available to make your electricity in. For this reason, someone living in Connecticut will have to outlay more money – just for more panels – than someone living in San Diego, for example, in order to go solar. More panels also take more space, so you also need a bigger roof to go solar in Maine than in Arizona. The Federal Investment Tax Credit is the biggie. At 30%, this affects every state equally and allows you to use a third of the cost of your solar system to reduce your Federal income tax. There are so many individual state incentives and they change frequently so it is best to check your state’s current incentives in the DSIREUSA database or contact a solar firm in your area for a free estimate (it is their business to stay up to date on what is available locally). Under net metering, the solar power your system produces, offsets the grid power that you use. The meter runs forwards when you use electricity and backwards when you generate electricity, and at a predetermined “true up” period, your electric utility then credits you back for the kilowatt-hours your solar system generates, reducing your electric bill. The various states have various net metering rates, and you can find yours here, or by arranging a free consultation with a solar firm that installs in your area. With net metering, the solar panels are offsetting the kilowatt use of the home on which they are installed and the state will pay full retail value per watt to the homeowner; the system works using one meter that can count up and down as electricity is produced or consumed. If you live in the states whose Public Utility Regulator (PUC) allows utilities to charge you more money for using less electricity, your electric bill before going solar will be higher on average than electric bills of people living in the states that have regulated their electricity providers and “decoupled” earnings from sales. Decoupling utilities gives those utilities an incentive to help you save electricity, rather than to try to sell you more. 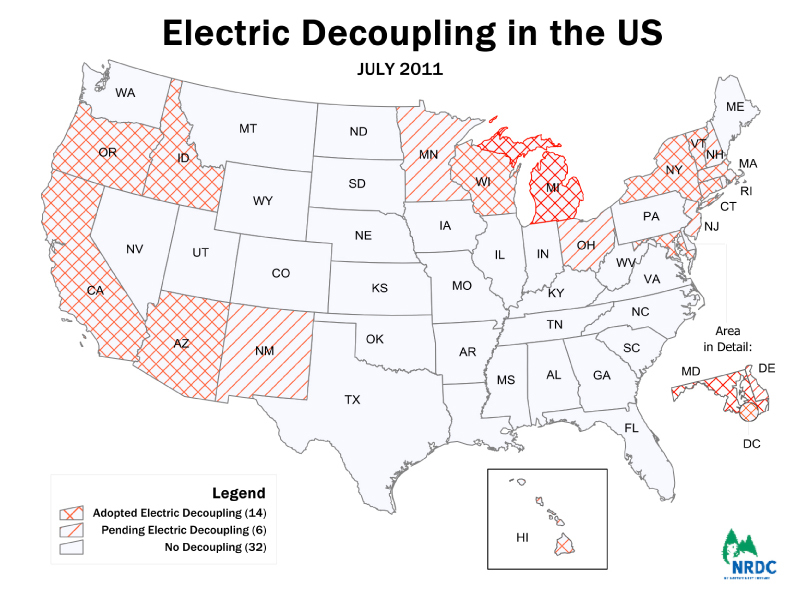 So utilities in decoupled states like California earn more if you use less electricity. Conversely, utilities in states like Alabama charge customers more if they use less electricity. So if you live in Alabama and pay the state average of $1,740 a year ($145 a month) chances are good that your electrical use is much lower than a Californian who pays that high of a bill. Let’s look at a typical utility bill. You can find the EIA data on average utility bills in each state here. Let’s say you live in Alabama, and you pay the highest average bill nationally; $145 a month. That comes to $1,740 per year. But notice; Alabama is not a decoupled state, so this very high bill does not correlate to higher energy use. Alabama utilities are allowed to charge you more if you use less of their electricity. How does that affect your solar panel savings? That deceptively low use becomes a plus when sizing a solar system. The less electricity you really use, the smaller your solar system needs to be to supply it. The smaller the solar system, the cheaper it is, obviously. Let’s look at a typical utility bill. You can find your state’s average utility bill here. you (in Alabama) pay the highest in dollar amount, you might find that a solar system large enough to supply your usage actually costs quite a bit less than average nationwide, simply because you really don’t need as large of a solar system. You might well not use enough electricity to warrant getting a 5 kW system, the average in these previous examples. You might only need 2.5 kW, which will be a lot cheaper. OTOH, though, since Alabama is decoupled, your utility could turn around and charge through the roof for those last few electrons you still get from your electric utility. So, in a state like that, it might turn out to be preferable to simply go off the grid, so you don’t get dinged a high rate for using too little utility power. So, these averages don’t tell you what your case might be.This is why you should consult with a solar company in your state. So What’s the Real Cost of Installation (or your solar panel savings)? In 2016, installed solar now generally comes in at a bit over $3 a watt, according to the Solar Energy Industry Association (SEIA). A 5kW system, on an average-sized house in 2016 — which would need about 500 square feet of roof space — would cost between $15,000-$18,000 fully installed in most of the US. This is a definite drop in price within even the last few years. In fact, as of the first quarter of 2016, solar panels have dropped an astonishing 70 percent in price since 2006 according data tabulated by the SEIA. Keep in mind that this cost applies only if you will be investing in buying your own solar by paying cash for solar systems, as opposed to leasing them. There is no cost if you simply switch electricity providers from your current utility to a Third Party Owner (TPO) like SolarCity or Sungevity. TPO’s are sort of the new electric utilities, they sell you the (solar) power, but they can sell it at a lower cost than your utility by housing your individual solar plant on your own roof, instead of building a dirty fossil fuel power plant far away and then sending that power to your house. So, renting power from a TPO is more akin to simply switching to a cheaper internet provider and paying less from the first month. There is no investment involved. There are savings, but nothing like the savings possible if buying your own. No pain, no gain. So how much do solar panels save in reality? 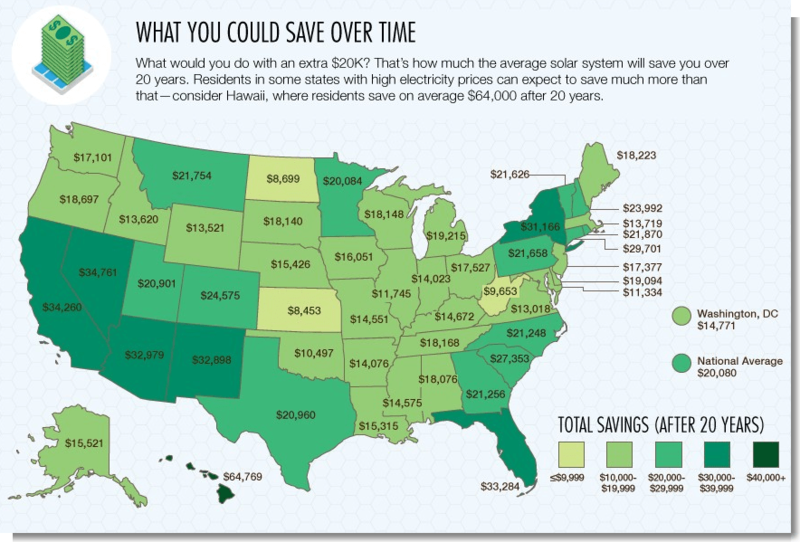 This infographic gives you a great look at each state and how much you could actually save just in the first 20 of those years, when you buy your own solar system. Going solar will affect your finances but in a good way. The thing to look at is how much it can save you, and how soon you can start saving. In general, you could save between $10,000 and $70,000 – depending on where you live – over the course of the usual warranty period for a solar array, 25 years. As mentioned earlier, certain states just aren’t going to have as great a savings as others. This is because every state has its own unique combination of the factors; insolation and policies, as not every state offers the same kind of benefits for installing solar, and has the same hours of sun. Going solar in California can save you nearly $35,000 over 20 years, because California offers lots of incentives to install solar. In an up-and-coming solar state like Georgia, you’ll save a little more than the average. However, if you install a residential solar system in Kentucky, it’s only going to save you a little over $14,000 over 20 years. Still, $14,000 is nothing to scoff at. Living in Hawaii isn’t so expensive once you’re saving that much money — residents who go solar save an average of $64,000 after 20 years, and $73,000 over 25 years! Interestingly, these numbers are based on research from 2011 and the prices of solar panels have dropped since 2011 by 60 percent, so take that into consideration when you’re tallying up the savings. In fact, the average price of a completed commercial solar photovoltaic project in 2014 dropped by 14 percent and by more than 45 percent since 2012. But by far the biggest savings long-term come when you buy your system, by paying cash if you can (or by borrowing) and paying upfront. This is the big advantage in paying cash for your solar system as opposed to leasing it, or renting the power it produces – the incredible savings over the long-term. States vary when it comes to rebates and tax credits, but you will see 30 percent upfront savings due to the Federal Investment Tax Credit (ITC) of the gross cost. If you live in a state that has energy saving policies, you’ll see even more savings. It’s best to talk to your solar installation company and research the policies in your state. Besides the actual credits you receive, there’s hundreds of dollars of year you’ll save on energy usage, depending on your home’s size. Plus, there’s what owning solar panels will do to the property value of your home. A study by the Lawrence Berkeley National Laboratory in Berkeley, California found homes powered by solar sell for nearly $25,000 more than traditionally powered homes. In states where the cost of energy is higher, like New England, Alaska, Hawaii, and the Southwest, these panels are sought after. This means you’re investing not only in a cleaner future, but a more profitable one to boot. Like any home installation or repair, it’s best to talk to multiple providers. Rates will vary depending on where you live, so do your homework and look into what the total savings will be for you and your home. Just know that the savings are there, and they will be more significant than you think. So — will solar cost? Yes, but that’s not as important as how much solar panels save. Have you gone solar? How much are you saving on average? Let us know in the comments!